Since I have been making Lego related posts each Monday, mainly in relation to my Etsy store, I thought I would take this week to share a custom creation I’ve recently created. I was inspired to create a custom minifigure based on Kevin Matchstick, the lead character of Matt Wagner’s Mage comic book series. At Brickfair last summer, I took some time to check out the Brickarms table, where they displayed their custom weapons for sale. While perusing their myriad choices of historical, modern and science fiction rifles, guns, lasers, and related ephemera, I came across their selection of translucent blue weapons and it was the simplest of weapons that inspired my creation. A baseball bat in translucent blue plastic reminded me of the weapon of choice of Kevin Matchstick, the protagonist of an old comic book by Matt Wagner called Mage . 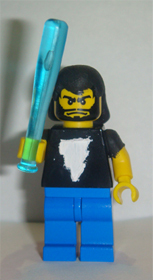 In the story, Kevin Matchstick is unknowingly a reincarnation of King Arthur, and Excalibur is represented by a baseball bat. The Brickarms bat reminded me of the manifest power of the bat in the comic book and inspired the custom figure on sight. Six months later, I finally needed to make my customization. I went through my collection of Lego minifigures and pulled out parts I thought were appropriate. Blue legs to represent his jeans, a black torso, and yellow arms and hands. Since Lego doesn’t really do t-shirts, the top half of the arms were painted to be t-shirt sleeves. The next step was to create a stencil and paint the lightning bolt on his t-shirt. My inexperience with this activity showed through when I chose the wrong type of paper to use of the stencil, and I was cutting away the small threads that came off the paper and stuck to the edges of the paint. The one biggest drawback to my inspiration was the lack of mullets in Lego hair. It is surprising that they would not have the mighty hairstyle available as a choice, which required Sculpey to come to the rescue. Once the hair was created and baked, I felt the black Sculpey had too dull a color and painted it with two coats of black to give it enough darkness, and then it was time to assemble the minifig. I’m very happy with the way it came out, but there are little things I’ve learned making it that will improve any future creations. Inspiration can come from anywhere and anything, and in this case it was a small piece of plastic I came across on a table.